Intermodal handling is a series of gears and cogs all turning together with a specific purpose – the movement of laden and empty boxes across different modes of transport. The experts from Hyster Europe have been talking with inland/sea ports and terminals across Europe Middle East and Africa to find out what makes them tick, with the aim of providing solutions to meet the industry’s changing demands and help to maximise profitability through productivity. Highly congested ports and terminals require lorries to move through them quickly, this means a ReachStacker has to deliver not only reliability in time sensitive environments but also productivity from the machine itself. Of course, another important cog is the operator behind the controls, so over the years Hyster has worked with operators to develop the Vista cab, delivering optimal ergonomics and good overall visibility. The challenge of second rail handling, especially when there is a high cube on the first rail, can impact productivity, cost of ownership and operational cost. Often there is a spotter required to assist the operator in picking the box of the rail adding further unnecessary cost to the process. Hyster Europe has developed an innovative hinged elevating operator cabin option for the Hyster® ReachStacker which enables the operator to benefit from optimised visibility of the container corner casts as well as smoother twistlock engagement – all without the need for a spotter, or for the operator to leave the cab. Barge handling may also benefit from the elevating cabin solution because Hyster Europe can engineer trucks to the demands of its customers’ applications. The Hyster® ReachStacker equipped with an intermodal spreader is able to handle containers from the water’s edge to the stack with ease while operators benefit from on demand hydraulics to provide the power required at the point when it is needed. Operations can also save on cost of ownership due to only using the energy required. Empty container depots support larger operations and delivering the maximum return on each machine is essential to achieving profit in a very tough market. Hyster Europe has developed an 11-tonne capacity Empty Container Handler that allows for double handling of two 40-ft reefer containers with the cooling unit at the same end. This innovation supports terminals in reducing the time spent on reefer operations, allowing optimal levels of productivity and profitability. Hyster Europe provides innovative full-line solutions to support operations from moving of pallets in a warehouse, to stuffing and unloading of containers with 8-tonne or 9-tonne capacity counterbalance trucks, through to moving fully laden 45-ft containers. Hyster Europe hopes to continue to listen to, and work with, inland/sea ports and terminals to ensure that together we are able to meet the challenges of tomorrow today. 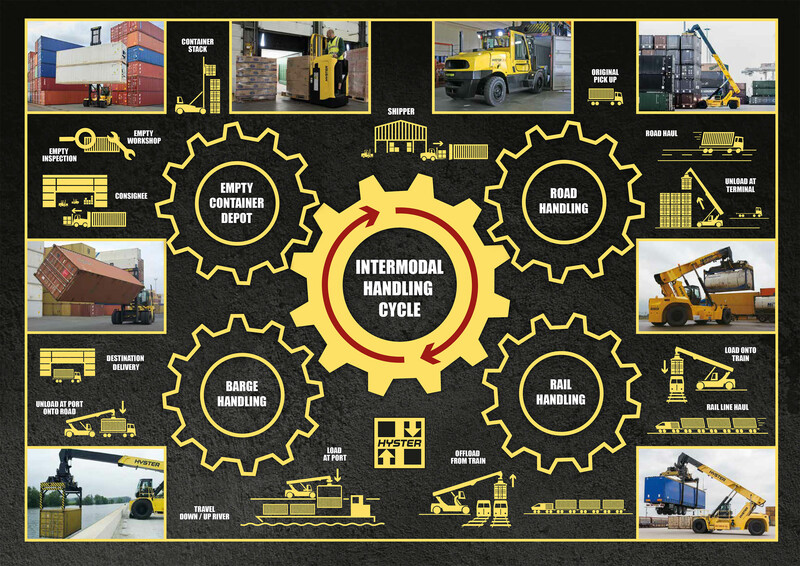 This new Hyster® infographic illustrates the stages of the intermodal journey: road – river – rail, telling the story of not just container handling but also the contents of these containers. At every stage of the journey from ship to shore and shore to store, there is a Hyster® materials handling solution to overcome the particular challenges faced. See the infographic below for more details or contact your local Hyster® distribution partner to find out more about choosing the right inland terminal handling solutions. This entry was posted in Attachments, Batteries, Big Trucks, Camera Systems, Coil Ram, Container Handling, Container Stuffing, Container weighing, Counter Balance, Cross-Docking, Electric Big Trucks, Electrics, Empty Container Handler, Fuel Efficiency, H11XM-ECD8, Hand Pallet Trucks, Hydrogen Fuel Cells, Hyster Rhine Tour, Intensive Applications, LI-Ion, Lithium-ion, Lowered Cabin, Multi Tool Changer Attachment, Ports and Terminals, ReachStacker, ReachTruck, Safety of Life at Sea, Solas, Solution, Special Truck Engineering, Steel Handling, Stevedoring, Warehousing, Wireless Asset Management and tagged Barge handling, Big Trucks, Hyster, Intermodal Handling, ReachStackers, Second rail container handling. Bookmark the permalink.